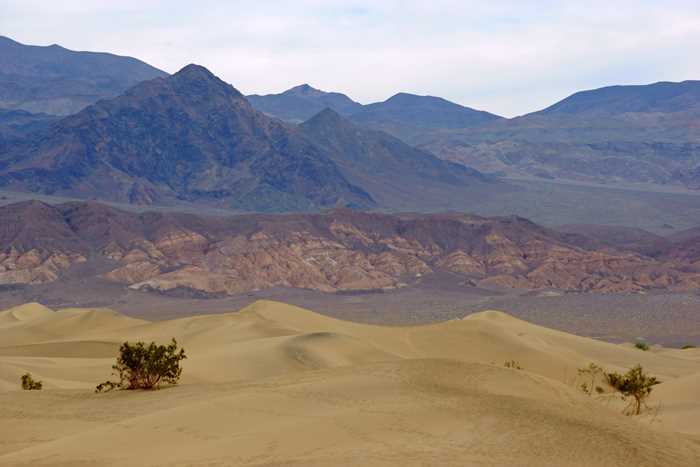 The Mesquite Flat Sand Dunes are a centerpiece of Death Valley National Park. 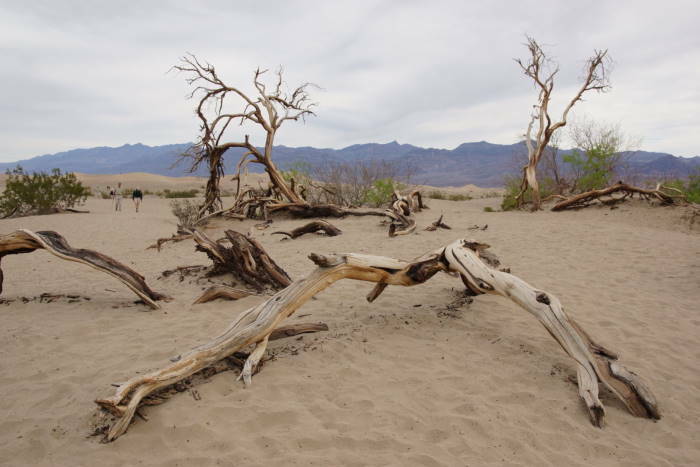 They’re centrally located, easily accessible, fun to hike, and beautiful for photos. There’s nothing quite like the feel of warm sand, pushing between your toes. And if you plan your visit early or late in the day, it will be even better. 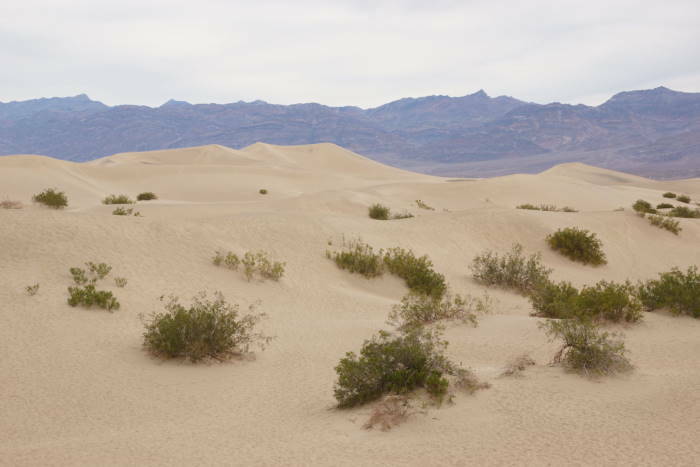 Mesquite Flat Dunes are located to the east of Stovepipe Wells, along California Highway 190. You’ll find a well-marked, large parking area at the side of the road, and from there, you walk in. 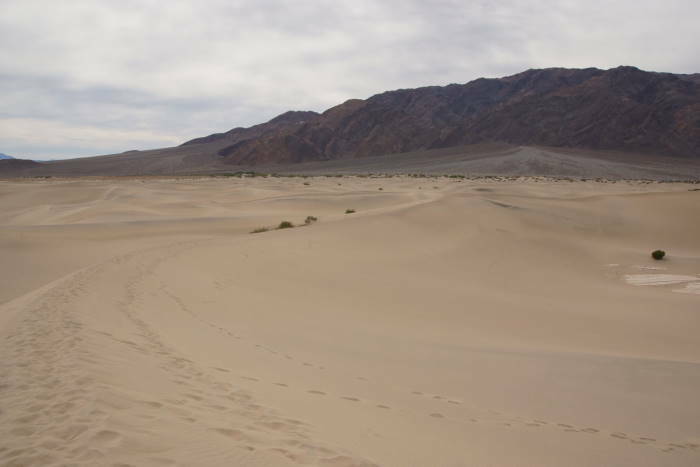 I spent an entire week in Death Valley on this trip, and out of all that time, I probably selected the worst day for a visit to the Mesquite Flat Dunes. It was overcast and grey, and even though it was still fairly early in the morning, there wasn’t enough sunlight to create those deep shadows on the waves of sand. Even though conditions weren’t perfect, I decided this was my best chance to hike out to the top of the dunes, so I headed into the sandbox. Hiking here isn’t easy at first, until you figure out how to do it. The technique is similar to walking through snow — for every step forward, you’ll slip backwards half a step. That means it takes some extra effort to get where you want to go. Try to step in the footprints left by other hikers. As soon as you leave the parking lot, you’ll discover that there is no well-defined path. 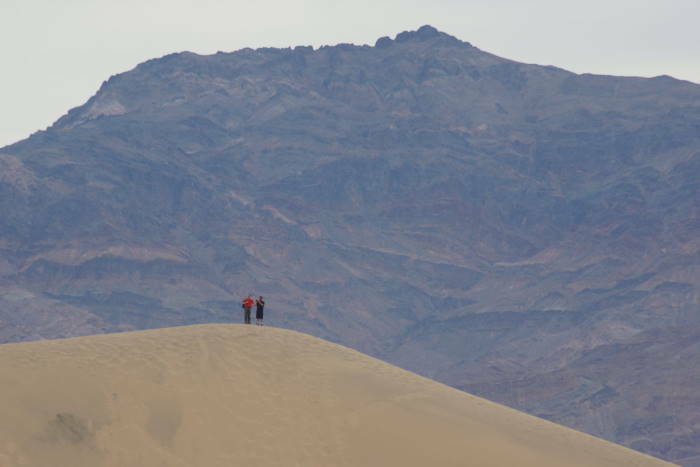 Generally speaking, you want to head towards the tallest dune, but that means crossing over several smaller hills along the way. You can try to go around some of them, but eventually you just have to go for it, and climb up a steep hill or two. I scouted out a route that worked pretty well. 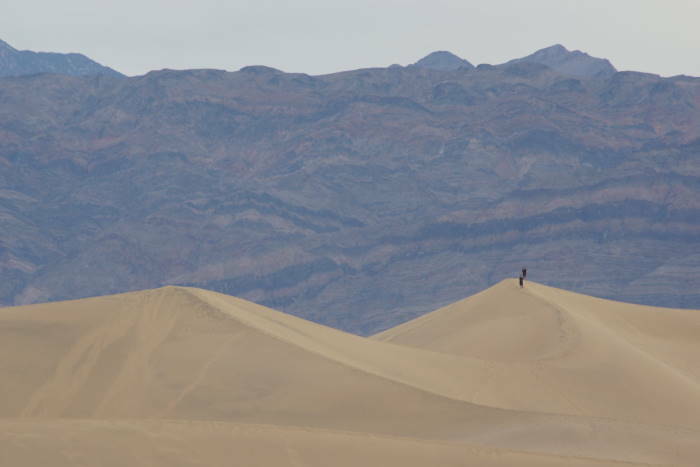 I had one very big dune to climb, but then I could walk along the crest, connecting to one dune after another, until I reached the tallest one. It still wasn’t easy, but it avoided a lot of the ups-and-downs. 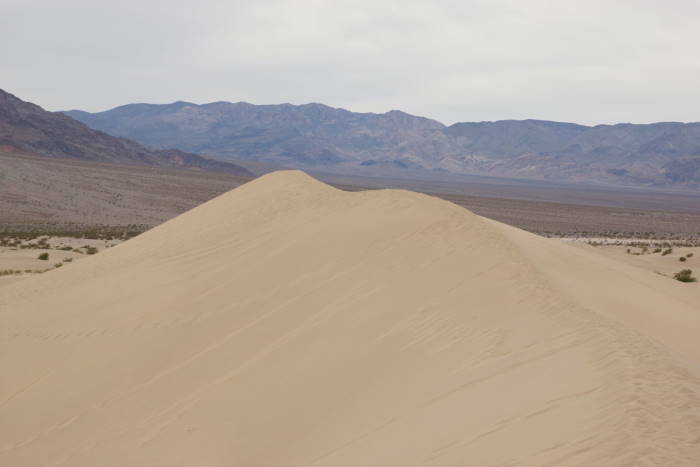 Balancing on the top of these dunes is quite an experience. It’s wide enough to walk up there, but it’s an interesting feeling to know there’s a steep drop on either side of you. My path to the top of the highest dune was paying off. There were a couple of people ahead of me, so I went slowly. By the time I reached the top, they were ready to leave. On the way up, I had kept my hiking boots on. But once there, I decided it was time to take my shoes off and play in the sand. It feels wonderful to push your feet into the dune, and bury your legs in the sand. … you get to see the unspoiled, wind-sculpted waves that stretch out in every direction. 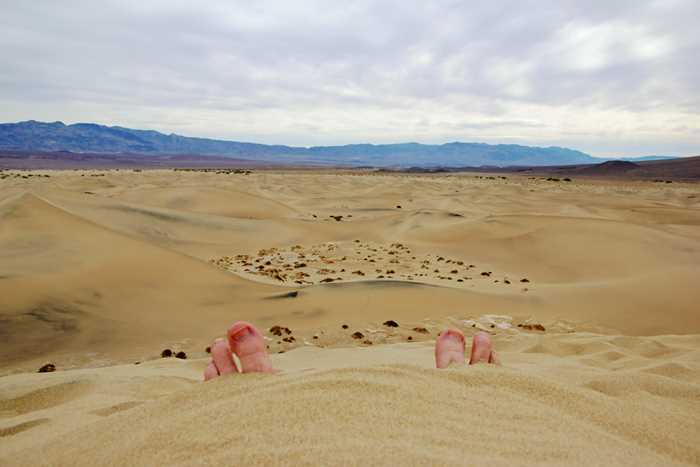 On the hike back, I kept my shoes off for a while, and enjoyed the natural pedicure provided by the sand. After a while, though, it was getting too rough on my feet, so I put them back on. 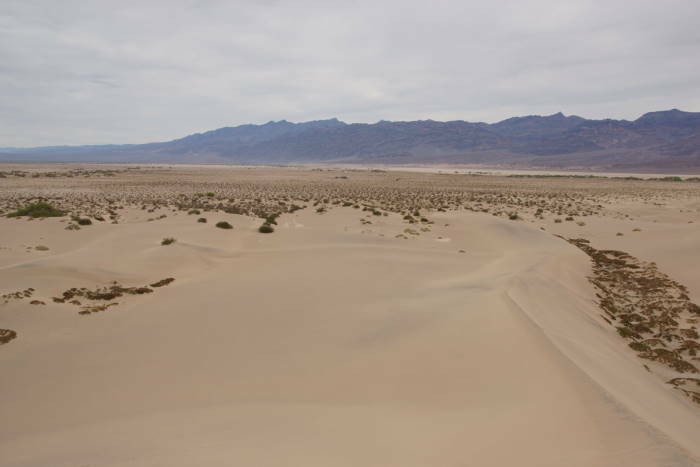 You don’t have to hike all the way to the top of the tallest dune to enjoy the Mesquite Flat Sand Dunes. Even a short hike can be fun. 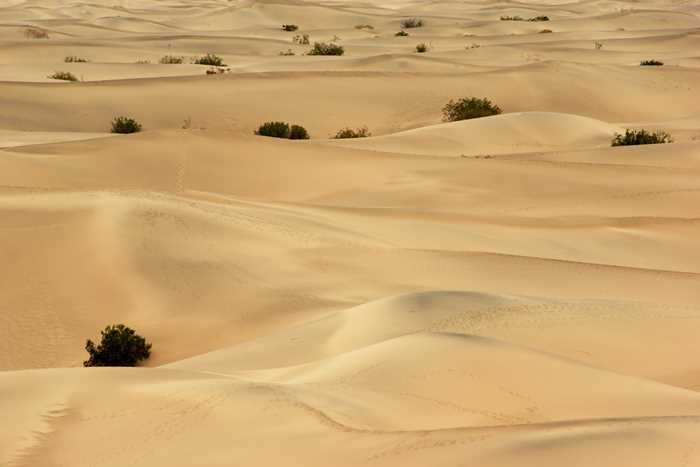 But, if you want to enjoy views of unspoiled sand, the best viewpoint is at the top of that tallest dune. You can probably make a leisurely trip out and back in about 90 minutes.